Tasted, written and edited by me, Dominique Noël a.k.a "LeDomduVin", a French-Bordeaux native naturalized American, as well as a well traveled, professionally trained and seasoned Sommelier, often characterized as a Wine Lover, Food Enthusiast, Life Biter, and more especially knowledgeable Wine Buyer since 1992, with in-depth experience in some of the greatest wine markets in the world such as Bordeaux, Paris, London, New York and now Hong Kong. Grand-son of a winemaker from the Côtes de Bourg, a small right bank appellation north of Bordeaux, I grew-up in the vineyards and literally in a giant empty barrel that was my hideout or "cabane". I made my career in the Food and Beverage industry, working as Sommelier / Wine Buyer, buying Wine & Spirits for restaurants and retails for the past 25+ years. I taste and buy wines regularly for my job and for my personal consumption, and like to share some of my opinions and experiences. This blog will give you details about some of the most intriguing and interesting wines that I tasted, drunk and bought (and more...). Pardon my French! for the few grammatical errors and other spelling mistakes. There is a search blog function box on the top left corner of the top bar. 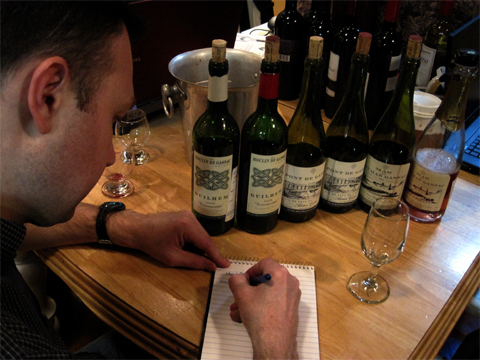 Write the name of a wine, a producer, a region...or anything else in it, who knows I may have wrote something about it. This Wine Blog is about wine as well as everything around the subject of wine (the producers, wineries and wines, their regions, sub-regions, vineyards, Terroir, history, geography, topography, geologie, climate, environment,etc..) and so much more. My posts are mostly facts embedded into stories about men and women, their craftsmanship and the result in the bottles. I personally despise all the snobbery and hypocrisy within and surrounding the wine world. People should be aware that most "vignerons" dedicate most of their time working hard in the vineyard and in the cellar, and put all their energy to produce the best wines they can every year. The winemakers have only one shot and (like a Chef in the kitchen) they must succeed, as too many things depend every year on the quality of the crafted wines. It is a high responsibility, and we should be humble and joyful when we drink wine, not adopting a snob or haughty attitude. We need to remember that they are farmers above all, working with an agricultural product that has many important meanings historically and geographically, locally, nationally and internationally. Wine is culture and traditions, religious or not, it has always been a part of the life of mankind for more than 8000 years. It is essential in our everyday life and has become the natural beverage of choice on every good tables and respectable houses across the world. Often served to complement food, it has always been there to enhance the mood of any occasions and bring people together to share and enjoy moments which will remain as unforgettable memories. Nothing snob about that, just men and women, wine, food and life.